Краткое описание: Wicked Jester, a band of four, are headed for a Friday night gig at The Coventry, a rundown dive outside of town. They arrive only to find the parking lot deserted, the club seemingly dead. The band's members: Pablo Ramirez, Andy Chang, Gabriel Gordo and Patrick Scott, stepping from their van, are startled by a voice from the shadows. She offers them four tickets to a circus -- tonight's the grand finale! Having nothing better to do, the four accept and the nightmare begins. 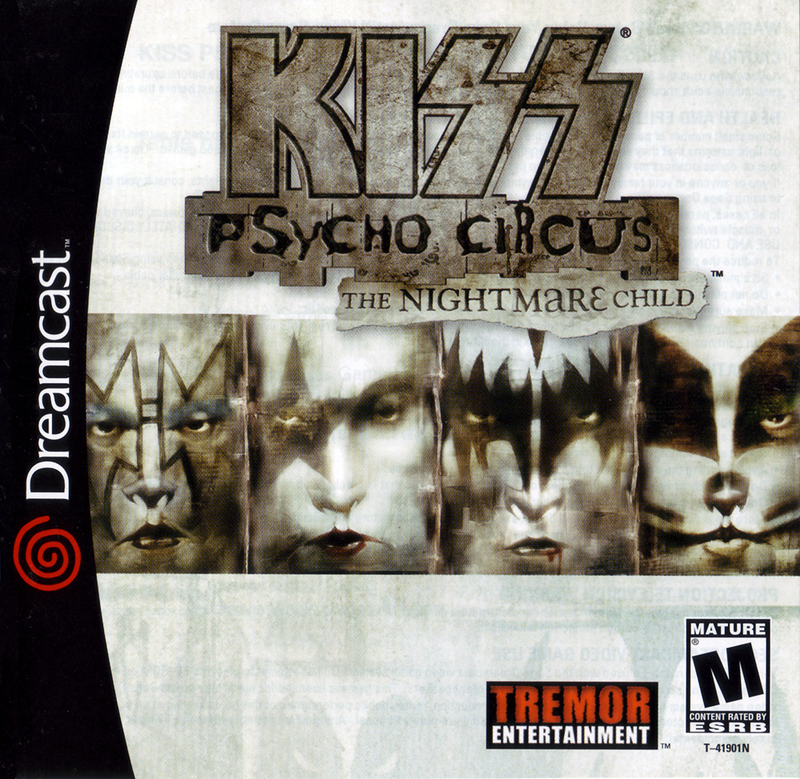 Based on characters from comic book author Todd McFarlane, KISS Psycho Circus: The Nightmare Child brings the horror and carnage of the Psycho Circus to the PC in a shooter format. 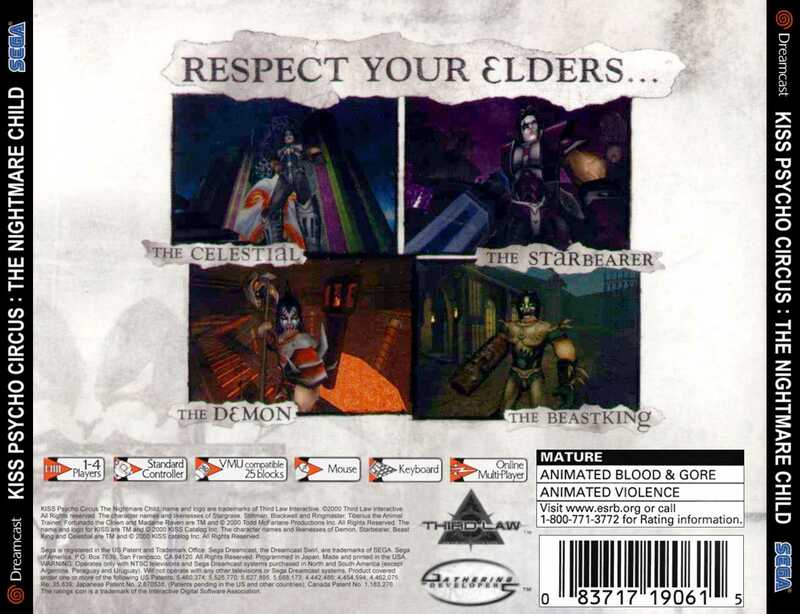 There are two-dozen creatures to battle with and three classes of weapons to use, each with four specific types: melee (beast claws, thornblade, twister and punisher), common (zero cannon, magma cannon, windblade and scourge) and ultimate (stargaze, galaxion, spirit lance and draco). In addition to the weaponry, temporary power-ups and instant items such as health, attack and defense powers are available. Wicked Jester, a band of four, are headed for a Friday night gig at The Coventry, a rundown dive outside of town. They arrive only to find the parking lot deserted, the club seemingly dead. The band's members: Pablo Ramirez, Andy Chang, Gabriel Gordo and Patrick Scott, stepping from their van, are startled by a voice from the shadows. She offers them four tickets to a circus -- tonight's the grand finale! Having nothing better to do, the four accept and the nightmare begins. Based on characters from comic book author Todd McFarlane, KISS Psycho Circus: The Nightmare Child brings the horror and carnage of the Psycho Circus to the PC in a shooter format. There are two-dozen creatures to battle with and three classes of weapons to use, each with four specific types: melee (beast claws, thornblade, twister and punisher), common (zero cannon, magma cannon, windblade and scourge) and ultimate (stargaze, galaxion, spirit lance and draco). In addition to the weaponry, temporary power-ups and instant items such as health, attack and defense powers are available. Издатель: Take-Two Interactive Software, Inc.